HOMETOWN hero Les 'Bubba' Tilley has achieved one mean feat, taking out this year's Charleville Cup. He was off to a promising start earlier in the program, winning the second race by a wide margin on Mark Johnstone's Schmizo, and backed it up with a repeat performance in the big race on Leslie Baker's Eschiele. 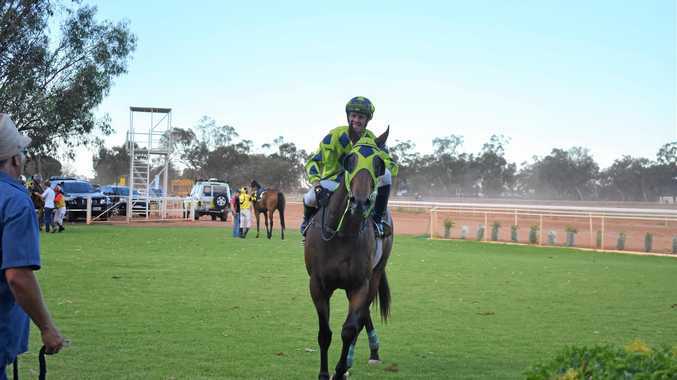 Leading from shortly after the 1000-metre mark, Tilley and Eschiele continued to storm ahead, widening the gap between second-placing Fab's Cowboy, ridden by Adin Thompson. Tilley is the third person in his family to win the Charleville Cup, following in the footsteps of his mother Carmel and father Ross. As well as taking home winnings and the Cup, Tilley has also cemented a place at the George Moore Stakes Day in Brisbane next month.